Registration for Scottsdale Parks and Recreation Fall Classes begins 7:00 a.m., Monday, July 31 for Residents of Scottsdale. Search for class offerings online at Recreation.ScottsdaleAZ.gov. when registration opens. Online is the quickest way to sign up. You are encouraged to set up your account now so that you are ready July 31. This fall new classes like family hikes in the preserve, new dance classes for youth and other leisure activities are planned. For more information, visit ScottsdaleAZ.gov and search "leisure education". Wolf Springs Ranch rezoning equestrian/rural to smaller lots and increased density of 41 homes on 20 acres at NW corner 94th and Cactus Road. Adjacent neighborhood representatives have continued concerns and will be speaking at this hearing. Granite Reef Townhomes aka Hudson East 8340 E McDonald Drive rezoning from Commercial to Urban Neighborhood to build multifamily complex. Escondido Manor, Lot 10 request to add a second story to existing home 12768 N Windrose Drive. July New Land Cases--are any near you? NE corner 70th Street and Continental Drive Request to rezone a mobile home park to Suburban Neighborhood and to build 65 single family 2-story homes with zero foot side yard on one side of the home. Taylor Morrison is the proposed builder on 8.9 net acres. Case 12-ZN-2017. This is the MH site that was in Scottsdale news for more than a year while elderly residents were removed from their longtime affordable homes. 6828 E Duane Lane (south of Dixileta Drive) Approved on July 10th, Assisted Living 10 bed facility. Friday, July 21st Moonlight Swim 5 to 9 pm McDowell Mountain Ranch Aquatic Center. Regular swim fees apply. 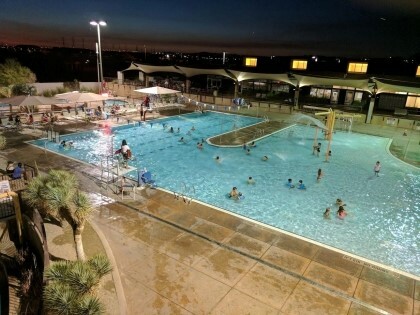 Saturday July 22nd Moonlight Swim 5 to 9 pm Eldorado Aquatic Center 2301 N Miller Rd. Wednesday July 26th Children's Indoor Birdwatching 10:30 to 11 am Appaloosa Library 7377 E Silverstone Drive. Learning calls and doing crafts. Thursday, July 27th 4 to 5 pm Macrame Hummingbird Feeders Workshop in the Gallery at Civic Center Library. Learn from local artist Amy Guerrero. July 28th through August 25th Live & Local Fridays summer concerts will be held in both indoor venues of the Scottsdale Performing Arts Center in Civic Center. At 8 pm enjoy larger Arizona bands in the Virginia G Piper Theater and smaller ensembles on Stage 2 beginning at 8:30 pm. It all starts with Americana, blues, flamenco, jazz, Latin and pop as 10 Arizona groups are scheduled to perform through the summer. details at www.ScottsdalePerformingArts.org or 480 499 8587.
at McDowell Mountain Aquatic Center 15525 N Thompson Peak Parkway $32 residents for the week. Kids learn the FUNdamentals of different water sports--swimming, diving, water polo and water basketball. What is happening at your Museum of the West? Did you know that you can reserve the architecturally stunning Virginia G. Piper Charitable Trust Theater/Auditorium? This versatile and intimate multimedia venue is a popular choice for private events. To learn about reserving the theater/auditorium, please visit their Private Use page. This month you will enjoy an inaugural exhibition that features 118 western film posters and lobby cards dating from the 1890s to the mid-1980s, curated from one of the world’s largest—and most historically important and inclusive—collections of western film graphic arts. The first of many planned exhibitions featuring posters and objects from the collection, it celebrates the American West, cowboys, Native Americans, the history of the movie industry, and the power of the West’s cultural legacies. It also pays tribute to Rennard Strickland (Osage/Cherokee), whose collection of more than 5,000 items was acquired in late 2016 in an education and community partnership between Western Spirit: Scottsdale’s Museum of the West and the Arizona State University Foundation for A New American University. This exhibition, on loan from The A.P. Hays Collection, includes 100 striking and historically important portrayals of one of the world’s most revered natural wonders. Oil paintings, watercolors and prints dating from the 1850s to the 1950s capture the ecological, sociological and visual diversity of the Grand Canyon, while showcasing a range of artistic styles such as naturalism, impressionism, and abstraction. Thomas Moran, Eanger Irving Couse, Gustave Baumann and Gunnar Widforss are among the celebrated artists included in this exhibition. Do your summer house guests like bronze sculptures? Take them to the selection of more than 20 bronze sculptures by award-winning sculptor and painter John Coleman celebrates one of the nation’s most important artists of the American West, as well as the arts patronage of collectors Frankie and Howard Alper. Coleman’s stories about Native American culture are conveyed throughout the exhibition, as his artistic process is illuminated. CITY COUNCIL IS ON VACATION. The Desert Discovery Center LLC will deliver their concept by the deadline 31 July 2017. They are scheduling multiple Public Meetings to present their design and business plan to finance the construction and the continued operations and maintenance. The next COGS E-Newsletter will cover their presentation and update you on the Protect our Preserve and the NoDDC citizens' groups activities. Have safe summer travels.....Scottsdale Schools begin in early August ---Look out for children!